Xavier Cha, In The News. Image courtesy of the artist and the Renaissance Society. Photo by On The Real Film. “Intermissions” is held in between exhibitions, when The Renaissance Society is normally closed in preparation for its next show. The Ren plans to host the series one day at a time, twice a year, to allow different artists to explore the space through various kinds of media and performative works. 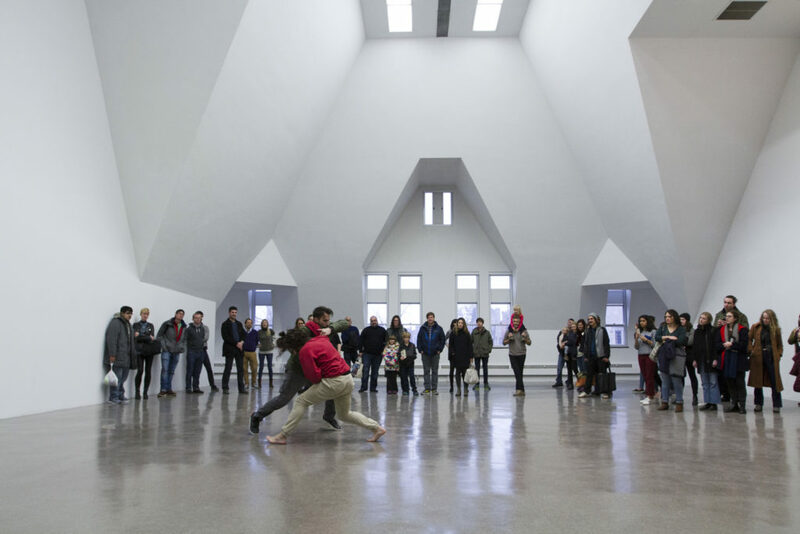 Solveig Øvstebø, the Ren’s executive director and chief curator, says that Lund curated “Intermissions” as a way to use the gallery “as a site to stage experimentation and production.” The space itself is vast, and, for this first performance, was completely devoid of the frames and sculptures one might expect at an art gallery. The work presented on this day was “In the News” by New York-based artist Xavier Cha, who produces mostly live and video works. Cha created “In the News” to express “how everything is being sensationalized, and how manipulative things are in the media.” She hoped the piece would draw on the audience’s tendency to dramatize what they view. “There’s a violence in viewing itself, the act of fetishizing viewing,” she explained. Indeed, the progression of the piece forced the audience to pay attention, largely due to its many elements of mystery. At first, I wasn’t even sure where to stand: there was no clearly defined area that separated the audience from the performers. The other attendees and I simply stood around the gallery, and I expected that at one point, we would be instructed to go to one side or the other. Actors Nate Hitpas and Tony Vittorioso engaged in a fight choreographed by artist Xavier Cha and Greg Poljacik for Cha’s performance piece “In the News.” The work was the first in The Renaissance Society’s new “Intermissions” series, which will occur twice a year. Instead, shortly after the event was slated to begin, and with no introduction, two actors catapulted into the expectant crowd, engaging in a choreographed physical fight. 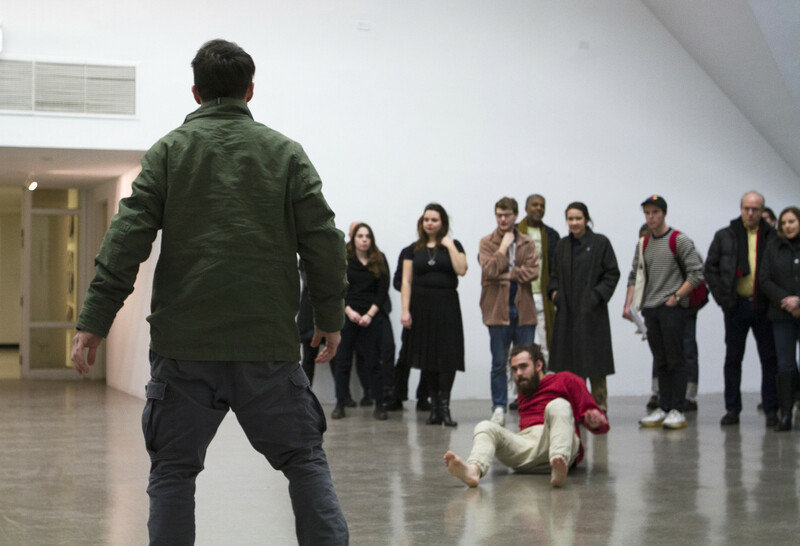 The confrontational encounter traveled all the way around the room, forcing the audience to accommodate the fight as it moved from one area to another. There was no designated performance space because the performance took place everywhere, utilizing the room to its fullest capacity. As the performance continued, the location of the actors was just as unpredictable as when they began. Eventually, the two ran out of the gallery, with the watchful eyes of the audience following them. Some audience members appeared to go looking for the actors, but the rest waited for them to return, no longer able to anticipate what would happen next and consumed by the world that Cha had created. The actors themselves were also skilled, pulling off stunts that Lund noted would normally only be seen in movies. Cha always envisioned the piece as a live performance, but she also wanted it to have a cinematic or theatrical feel. “It’s something you would be used to seeing as a video, like an Instagram clip,” she said. As her art often takes the form of live performance or video, it was fitting that this work attempted to capture elements of both. The venue provided for “Intermissions” made this mission all the more feasible: “It feels like this strange vortex from a movie,” Cha said of the Renaissance Society space. Lund, who is also assistant curator for The Renaissance Society, was excited to invite Cha for the first work in the series. “The kind of work she makes feels like it could come alive in a space like this,” he said. It definitely took a life of its own—the performance was forced, due to its format, to play off audience reactions and movement, as though the entire room were a part of the performance. The performance was especially impressive considering the fact that, according to Lund, this is the first time the Ren has put on a live performance in a space like this. “It fits in with what the Ren believes in terms of working with new artists to generate something new,” he said. Particularly with “Intermissions,” there is enough time to develop a distinct character for each performance, with the next in the series slated for August. As “Intermissions” moves forward, it joins the movement of the art world as a whole in rethinking traditional, four-white-walls gallery spaces. Lund doesn’t think that these traditional spaces are disappearing, but that they can coexist side by side with more experimental ways of presenting art. “It certainly reflects the wide range of ways that artists are working,” he said. As for the future implications of “Intermissions,” Øvstebø said that it has the potential to transform how art is received at the Ren. Cool article, Ashvini! It’s fascinating the way these artists involve the audience. It reminds us of what lies in the core of art; it sometimes must displace the viewer to a point of discomfort in order to evoke raw emotion or to uncover new meanings.